A Northern Irish grower has won a prestigious award for outstanding agricultural achievement. 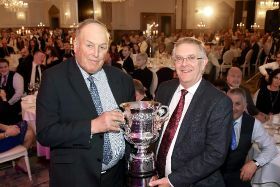 Thomas Gilpin of Gilfresh Produce was presented with the Belfast Telegraph Cup at the Ulster Farmers’ Union’s (UFU) annual dinner last week. In handing Gilpin his award, UFU president Ivor Ferguson said: “Thomas Gilpin is the founder of Gilfresh Produce, whose wealth of experience and innovative ideas have helped put Northern Ireland on the map as a major vegetable-growing region. Through Thomas’ dedication and commitment his vegetable-growing and processing enterprise has grown from a mere 4.5 acre field in 1965 to a multimillion operation with an annual turnover of approximately £18 million. During the evening Ferguson also fired a broadside at politicians both in Belfast and London, who he said were holding back farmers in Northern Ireland. “We have heard the excuses but it is time Northern Ireland had a functioning devolved government again,” he said. “Farming and food play a large part in the Northern Ireland economy and civil servants are making their own rules to the detriment of the farming industry.